This week, Supro continues its hot streak of vintage–inspired, low wattage amps with a 2x12 combo boasting plenty of headroom: the Neptune Reverb. This amp is available online exclusively through Reverb for a limited time, and was designed in response to requests for a mic–friendly amp with onboard reverb and a pair of 12–inch speakers. While the vintage tube vibe on models like Saturn Reverb and Thunderbolt have earned Supro a new generation of tone–hungry fans, the Neptune is a decidedly clean–first affair. 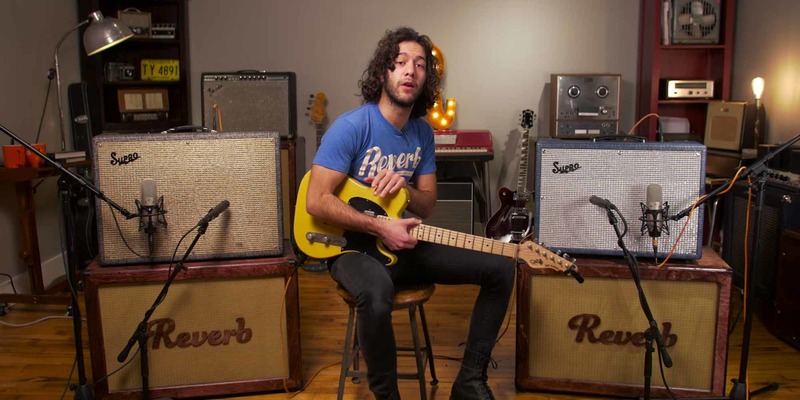 As Joe describes in the video above, the Neptune is Supro’s answer to iconic clean amps like the Twin Reverb or AC30. The Neptune runs at only 25 watts, but those are a loud 25 watts. Featuring 6973 power tubes, the Neptune maintains nice low–mid response at low volumes, which makes this a great amp for the home and small club alike. Its chimey cleans sound great with both dry guitar and pedals. Joe uses a Boss RE–20 and a Way Huge Russian Pickle in this video. The Neptune doubles down on the vintage flair, both on the inside and out. The stylings follow the rest of Supro’s amp line, with covering that looks like it was ripped straight from a vintage Sears catalog. The effects section sports a classic tube–drive tremolo and a 4–spring, 17” reverb unit. In this video, we're shooting out a new 1650RT Royal Reverb against a vintage mid-‘60s 1650RTA Royal Reverb. Which one wins? You tell us.